Short Description: The Henny Penny Evolution Elite™ isn’t just an advanced fryer… it takes frying to a whole new order of quality, simplicity and cost management. 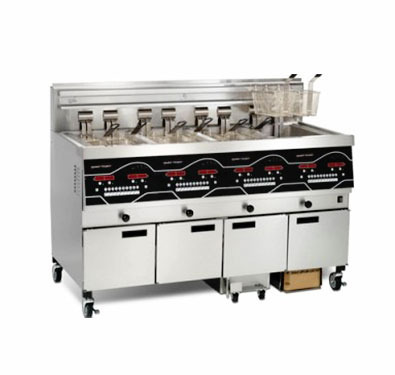 Henny Penny Evolution Elite™ series open fryers incorporate innovative reduced oil capacity technology that allows operators to significantly reduce frying oil consumption and extend the oil’s useful life. A smaller fry vat allows the same amount of product to be cooked in 40% less oil. Sensor-activated Oil Guardian™ monitors oil level and automatically replenishes cooking oil from an oil reservoir inside the fryer cabinet. This eliminates manual replenishing and results in less frequent oil disposal.